A Better Case for "Infant Baptism"
Helps for Worship #27: How Should I Come to the Supper? Baptism testifies to us of God's gracious, saving work (Matt. 28:19). He uses means to communicate his saving grace to his people by his Spirit (Acts 2:37-47). Christ's mediatorial work (Westminster Confession of Faith, chap. 8) is applied to us, then, by his Spirit through appointed means, namely, the Word, the sacraments, and prayer (Westminster Shorter Catechism, Q. 88; WCF 25.3). 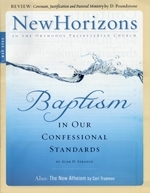 Baptism, as a sacrament, is one of those means. Jesus offers a challenge to his disciples: "Do you not say, 'There are yet four months, and then comes the harvest'? Behold, I say to you, lift up your eyes, and look on the fields, that they are white for harvest" (John 4:35). In recent months, atheism has become big news, and has also demonstrated its tremendous market potential. Books by Richard Dawkins, Christopher Hitchens, and Sam Harris have proved very popular; Dawkins and Harris, at least, have proved to be best sellers. I have lost count of the number of times I have seen people sitting on the train or on a bench reading one of their works. As to Hitchens, he is surely one of the sharpest journalistic minds at work today, and nothing he writes is, in my experience, less than stimulating and thought provoking. And this readable atheism is no preserve of the nonfiction section of Waterstones or Borders. With Phillip Pullman's popular fantasy novels, such as The Amber Spyglass, atheism has found its very own C. S. Lewis: a gifted writer of exciting adventure stories, which might well be described as epics of anti-Narnianism.